President Donald Trump's second-to-last stop on his first international tour is Brussels, where he's meeting with NATO leaders. One of those leaders is Emmanuel Macron. Let's see how the two world leaders are getting along. It doesn't look as if the two are rather excited to see each other. And, according to the photos, things could be going a lot better. The two look like they're on a bad blind date. The two presidents, each wearing dark suits and blue ties (Trump's was thick and royal blue; Macron's was skinny and navy) sat in antique cream-upholstered arm chairs, with two American and French flags behind them. They shook hands for an extended period of time. Each president gripped the other's hand with considerable intensity, their knuckles turning white and their jaws clenching and faces turning. 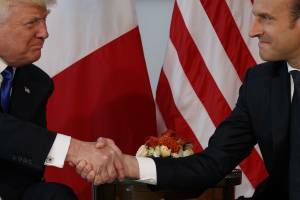 Looking at the video, Macron seemed to double down on the shake, pulling the president's arm a bit and tightening his grip. Maybe Macron has been looking at the video of Trump's handshakes, which, early in his presidency, have been must-watch for world leaders meeting him. And maybe Macron learned something from the president of Tajikistan, Emomali Rahmon, who one-upped Trump recently.